And as we say in Los Angeles, "That's a wrap!" 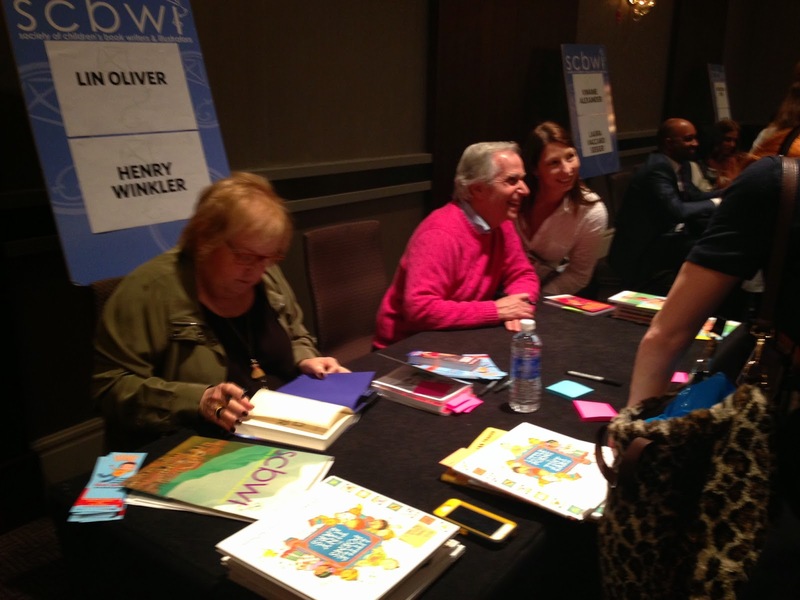 Thank you for joining us here on the Official SCBWI Conference blog! Lee Wind (top), and left to right: Jolie Stekly, Jaime Temairik, Martha Brockenbrough and Don Tate! 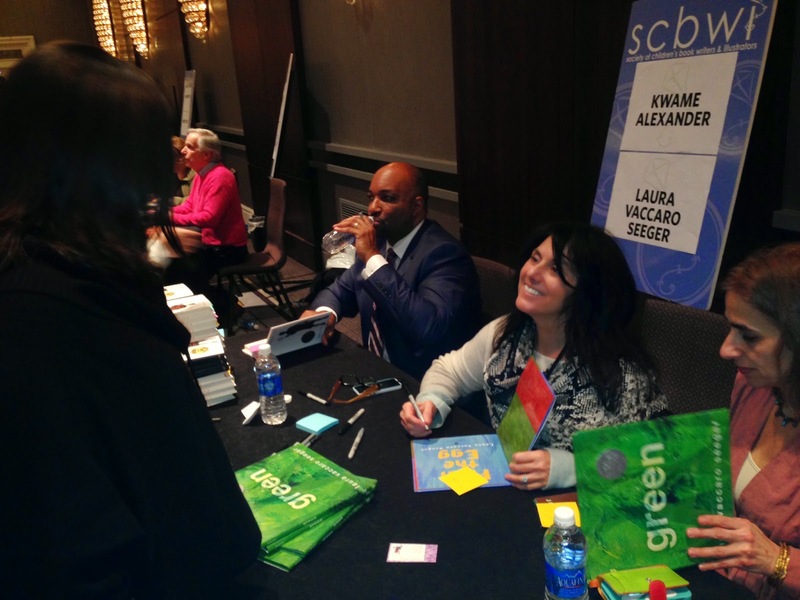 We hope you'll join Team Blog from July 31-Aug 3, 2015 in Los Angeles for all the craft, business, inspiration, opportunity and community the SCBWI Summer Conference offers. 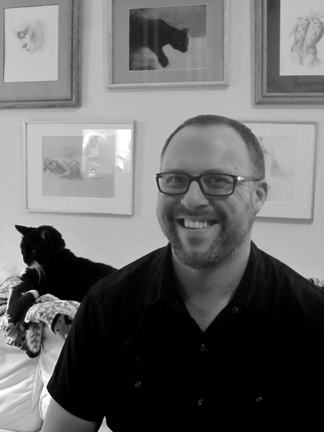 The 2015 Summer Conference Faculty will include Mike Curato, Paul Fleischman, Mem Fox, Jane O'Connor, Meg Wolitzer, and Dan Santat - who just won the Caldecott Medal! A little "jolie" for a Team Blog member. Linda Olafsdottir is an Icelandic illustrator, based in Reykjavík, Iceland. Linda’s been drawing ever since she could hold a pencil, and she’s still drawing every single day and never gets tired of it. 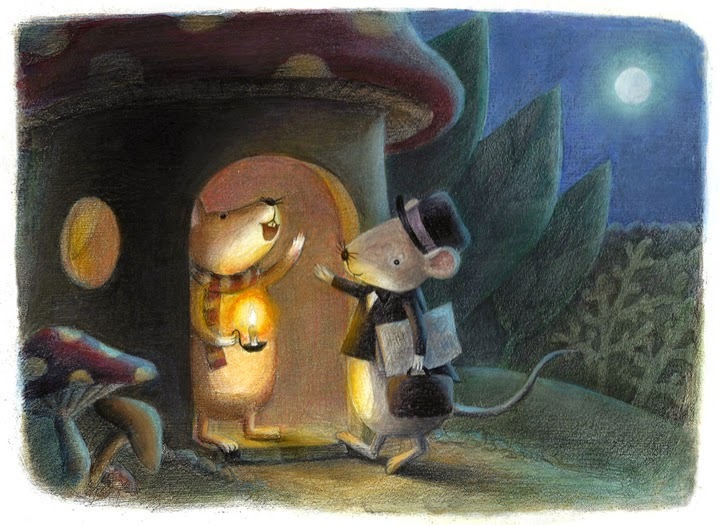 Linda got her MFA degree in illustration from the Academy of Art University in San Francisco. Picture books are her passion and she’s constantly being inspired by her two children and her surroundings. 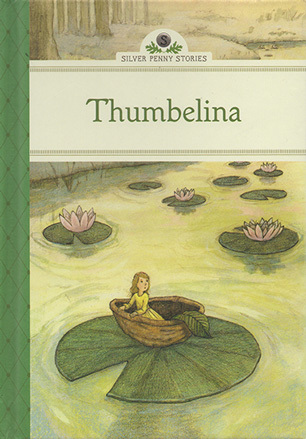 Most recently Linda illustrated three books for Sterling Publishing. 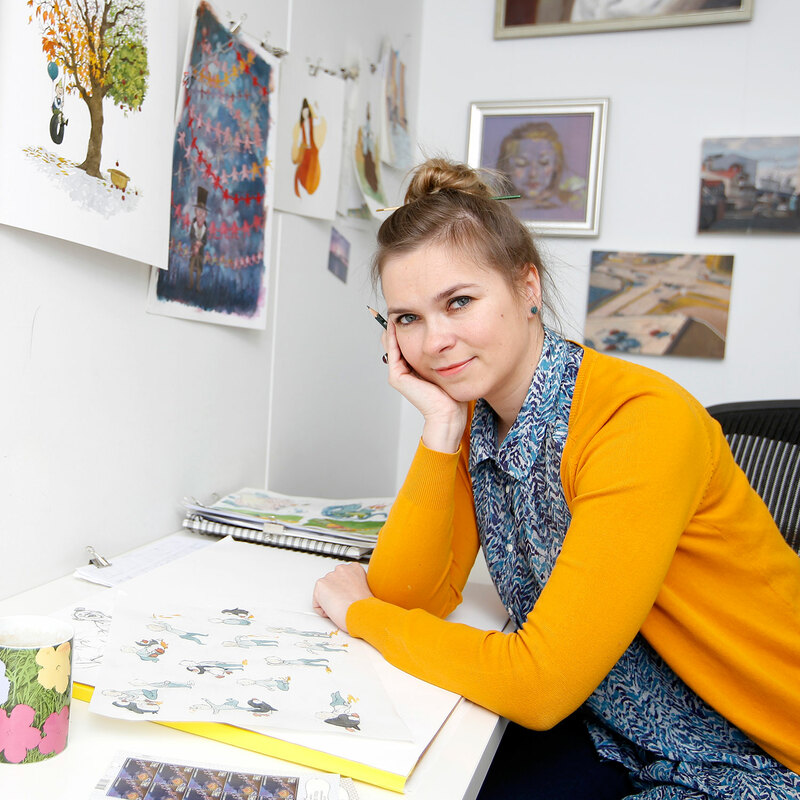 Her work has also been published in several picture and chapter books for publishers in Iceland. In 2014 Linda received Ibby’s (The International Board of Books for Young People) “Spring Breeze Awards” (ibby.org) and was one of Iceland's nominee for the Astrid Lindgren Memorial Awards (alma.se). I am a freelance illustrator in the Boston area, where I also teach at a local art college. I have a BFA in painting from the University of Central Florida, and an MFA in Illustration from Syracuse University. I also learned amazing things at the Illustration Academy. I love working in watercolor, solving visual problems, and seeing a story come to life through creating image. My illustrations are primarily narrative, although I also do editorial and advertising work as well, and my pieces have appeared in CMYK, 3x3 Magazine, and Illustration West. Suzanne had a great thing happen to her at the conference - her work was selected as an honor winner in the Porfolio Showcase! Born in the Midwest, Suzanne Kaufman grew up on healthy doses of Saturday morning cartoons and macaroni and cheese. 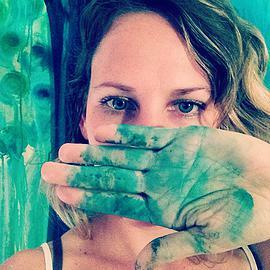 She has been monkeying around with children’s books, animation and cartoons since she was little. Over the years, she’s done everything from animating special effects for Universal and Discovery, to animating award-winning videogames. One of those games—Sly Cooper—won the Children’s Title of the Year award. 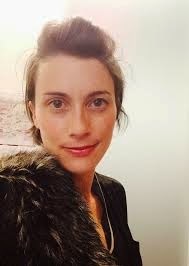 She currently lives in Seattle with her sweet husband and two energetic daughters and is a senior lecturer for film and video game animation. 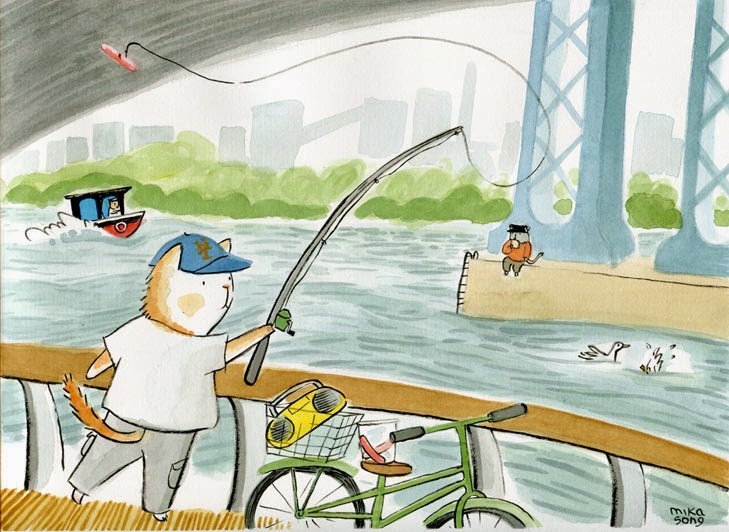 She’s the author/illustrator I LOVE MONKEY. You can visit www.suzannekaufman.blogspot.com to check out her sketch of the day. 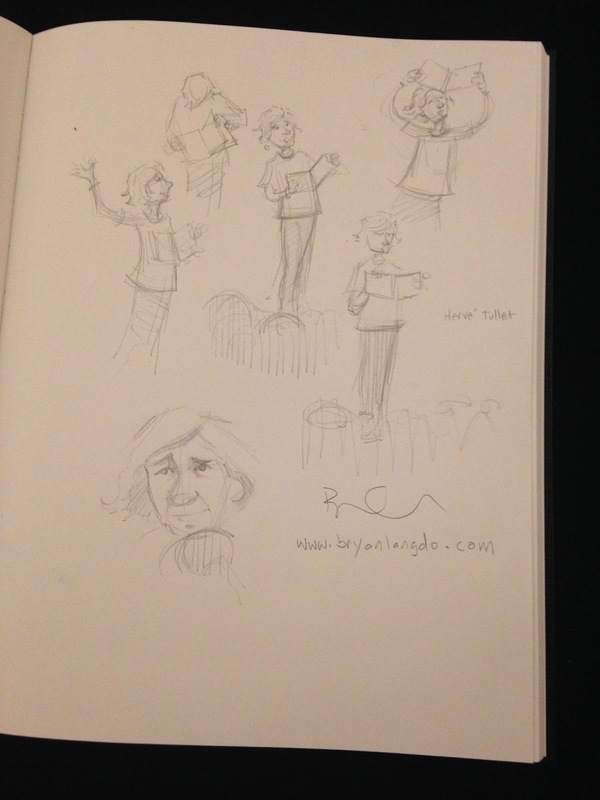 Bryan Langdo has illustrated nearly 30 books for children. 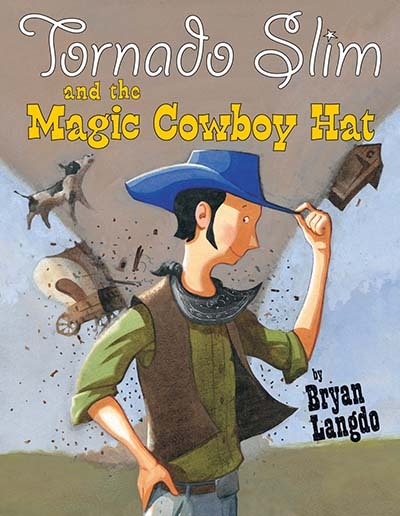 His picture book Tornado Slim and the Magic Cowboy Hat won a 2012 Spur Award from Western Writers of America. 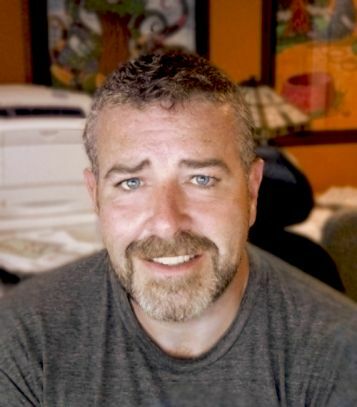 He is also an editor/writer for an ESL website and app. He lives in New Jersey with his wife and two kids. It's not every day that you get to listen to a closing keynote by the guy who JUST WON THE NEWBERY! 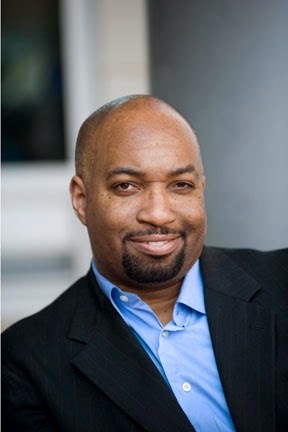 But that's how this 2015 conference came to a close, with a rousing talk by the one and only Kwame Alexander, author of 18 books including CROSSOVER, which the New York Times called "a beautifully measured novel"—and the Newbery committee agreed. His talk started with a standing ovation from the excited crowd, and it's no wonder. Kwame has contributed hugely to the world of children's literature. 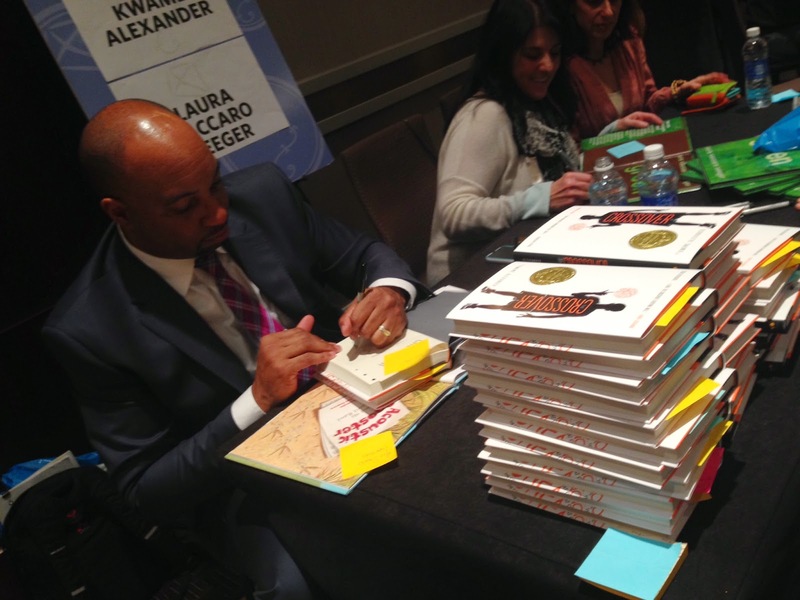 In addition to all of his beautiful books, he created the Book-in-a-Day literacy program that's generated more than 3,000 student authors at 69 schools across the US, Canada, and the Caribbean. He started off with a story about how he courted his wife. "I wrote her a poem a day for the first year." He even read us some of that poetry, which no doubt made more than one of us fall in love with him just a little bit. And he showed us what an incredible storyteller he is, talking about his family, about how he came to give this talk today, and even about the suit he stood onstage in. When he was starting out, he took himself on a 30-city tour to sell a book of poetry (including in a church! ), and found a job in a public school working that paid $25 an hour for working as a poet—but only for an hour a day. In being a parent and in working with students, he realized he could write love poems for teenagers. 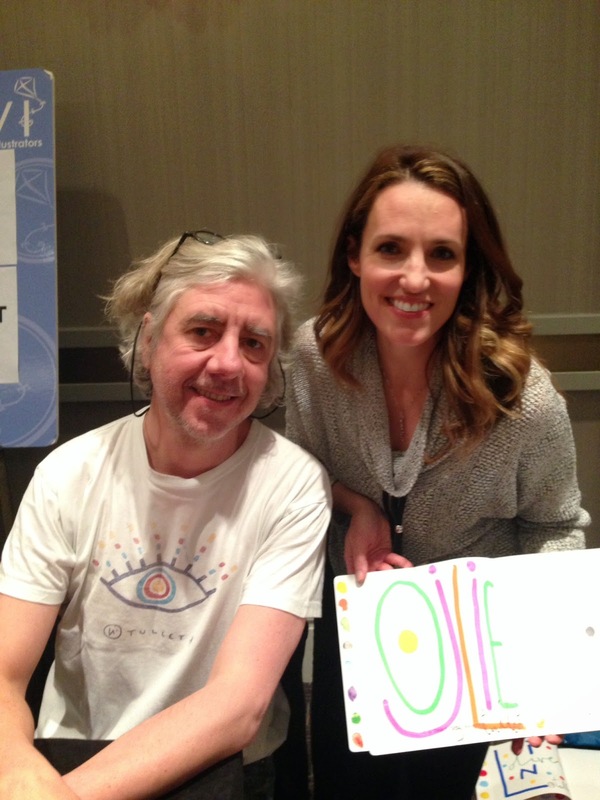 He wrote a book of funny, emotional, and sad poetry for kids, which he read all around the country including in a juvenile detention facility. No one wanted it, so he published it himself and got a starred review. He also sold 13,000 copies in the first year. 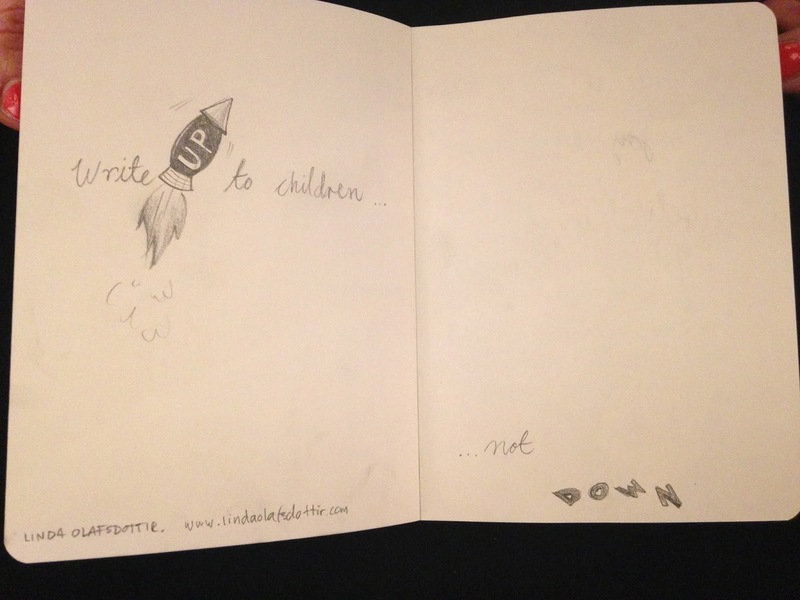 "This writing life is not just sitting in your room with a pencil and paper. It's about getting out in the world and having something to write about," he told us. But you also have to sell it and bring it to the world. "It's not just about writing and being an artist. You have to master the business side of writing." His Book in a Day program has turned into something incredible, traveling around the country and the world teaching kids to write poetry, and working with other writers at a fellowship he created after his application to one was turned down. This is part of his philosophy—not letting other people's "nos" define his yes. It was an incredible talk: hilarious, heartfelt, and full of wisdom and truth. 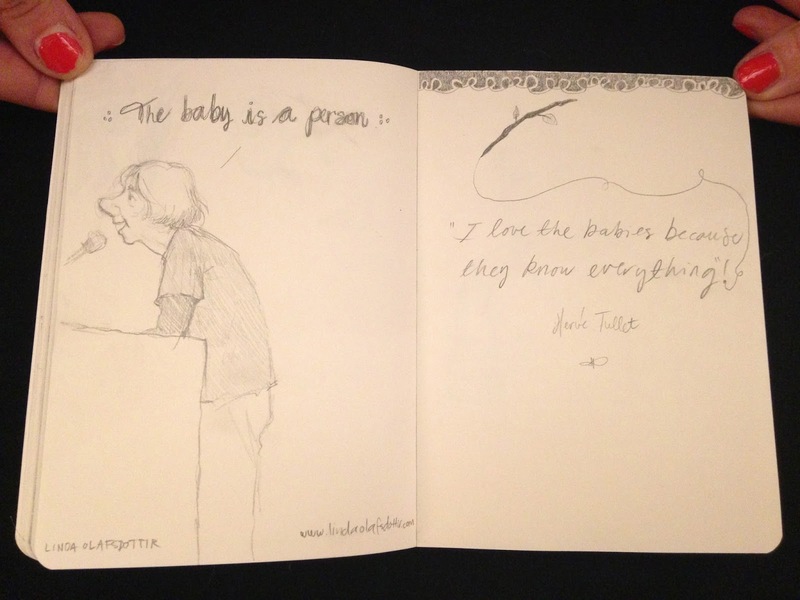 It's hard to think of a better way to end a conference—or turn the next page in our careers as writers and illustrators. And yes, we gave him a standing ovation at the end as well. To use Lin Oliver's words, Brenda Bowen is a "guiding light" in our industry. She has headed up the children's book division of several publishing companies, including Simon & Schuster. A few years back, Brenda became an agent with Greenburger Associates. Today, her clients include Samantha Berger, Tim Federle, Hilary Knight, Mike Curato, and many, many more. But that's not all! Brenda has written picture books and novels under the name Margaret McNamara, and she's also the author of a novel for adults coming out in June called ENCHANTED AUGUST. So, yes. She's pretty much a luminary in every way. 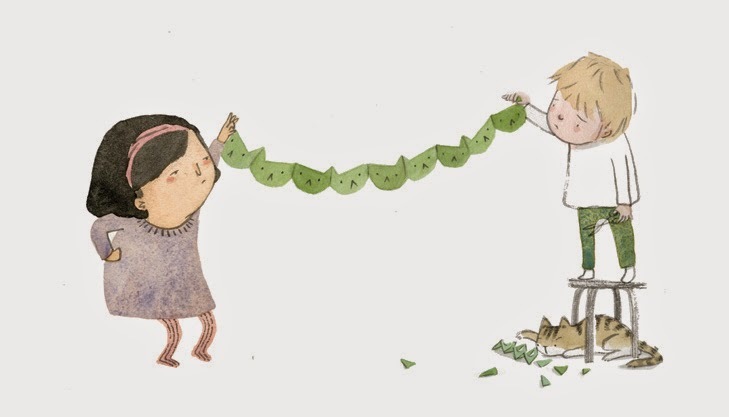 Do agents actually help authors and artists with their career paths? Or do you just make deals? How do you get an illustrator's work in front of people? 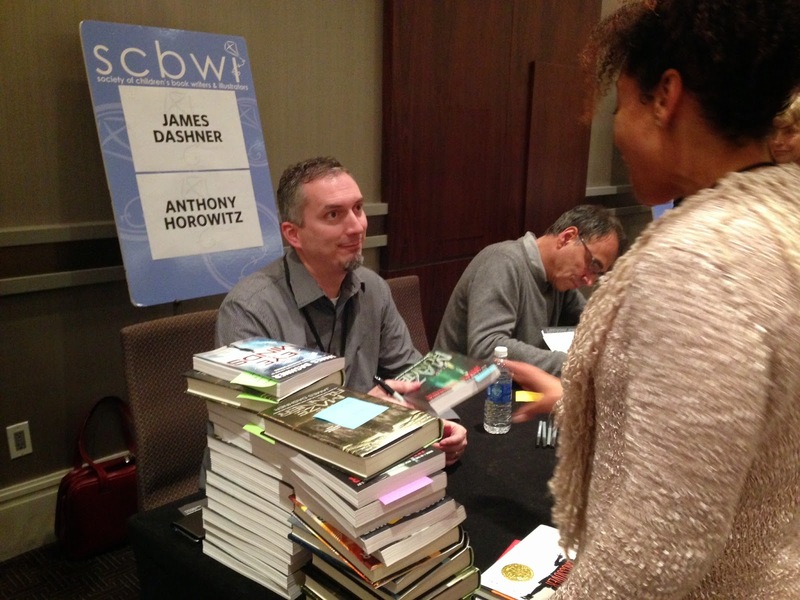 How do agents feel about writers who write across multiple genres? 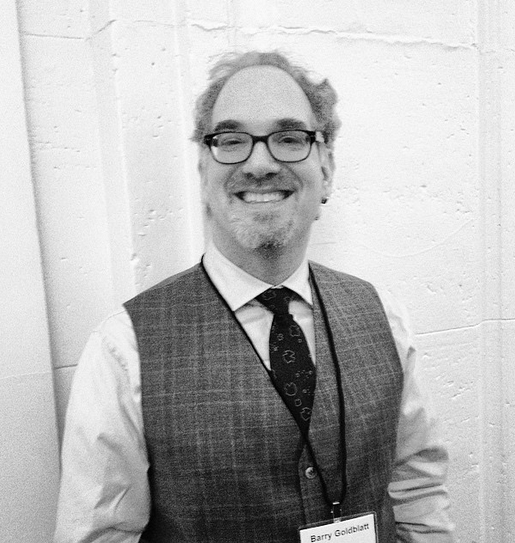 To find out the answers, check out recaps of Barry Goldblatt's comments, Jennifer Laughran's comments, and Tina Wexler's comments. Cindy Derby is a children’s book writer, illustrator and puppeteer. She began her journey as a puppeteer building puppets and performing in shows all over the world (including living rooms and underground railway stations). She was commissioned by Puppet Animation Scotland to produce her puppetry fable “Edward’s House of String”; and awarded by the Jim Henson Foundation to produce her one-woman puppetry musical “Mr. Kyoto’s Aquarium Shop”. 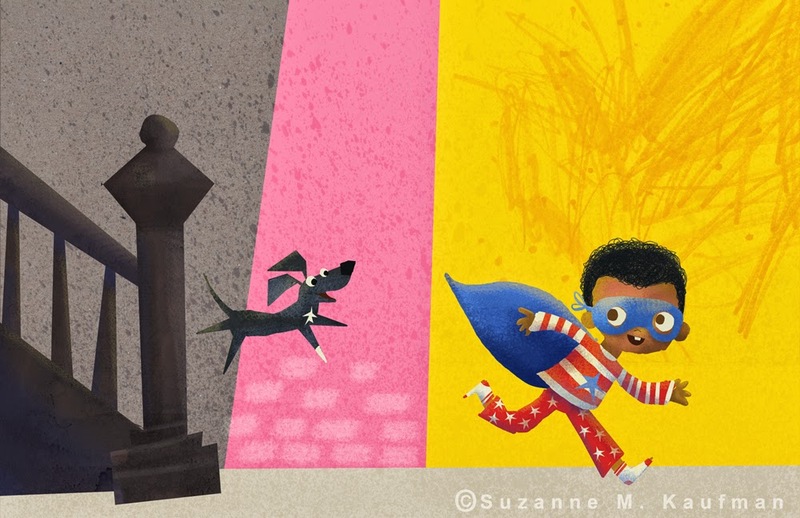 Continuing her love of storytelling, Cindy began creating picture books. She loves to use watercolor, acrylic, black ink, and cuts out pieces and collages it together digitally. She currently lives in Marin County, California where her art studio is a big lovely mess with large fur balls from her dog. 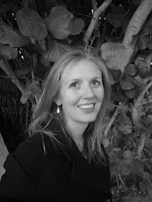 Jennifer Laughran is a senior agent at the Andrea Brown Literary Agency. 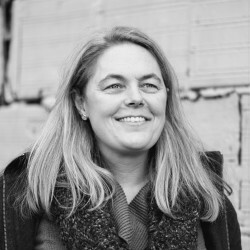 She joined ABLA in 2007 after many years as a buyer and event coordinator for an independent bookstore. 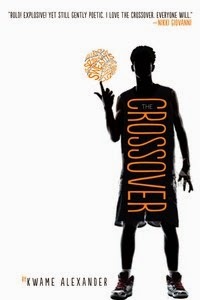 Jenn is always on the lookout for sparkling YA and middle grade fiction with unusual and unforgettable characters and vivid settings; the common thread in all her favorite stories is an offbeat world-view. She loves funny books, thrilling books, romantic books, books that make her cry, and all-around un-put-downable books. Query letters: Long enough to cover what she needs to know, but short enough to intrigue her. On success: "George" is a middle-grade debut novel by Alex Gino that Jennifer sold overnight to Scholastic. They got it Monday evening and made an offer Tuesday morning. It's being talked about as an overnight success. Except for the eight years Alex spent writing it. And the additional year the author worked with Jennifer on the book before it was sent out on submission. So it's really "a decades-long success." Jennifer represents a lot of established authors and also a lot of debut authors. 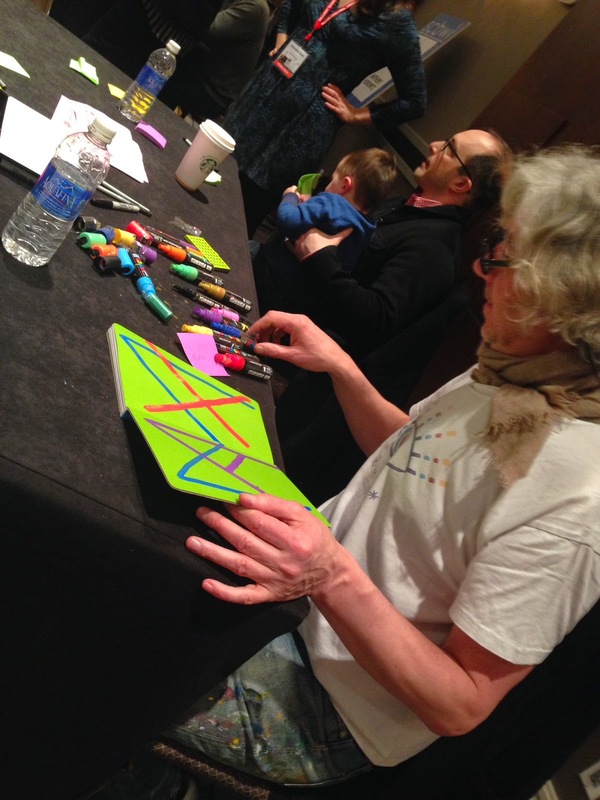 She looks out at the room of over 1,000 authors and illustrators and tells us she's always looking for new people, and hopes some of her future clients are in the room. Barry tells us of reading The Carnival at Bray after the Morris committee recognized it, signing Jessie Ann Foley on a Saturday morning, and finding out the following day that it was awarded a Printz Honor. "You never know how it's going to happen, but we're always looking." Brenda: Do you help shape career paths? Or just make deals. BarBar: There's such a wide swath of agent working styles. But much of what we spend our time on is planning out career moves and what the next step is. We talk about what makes the most sense to work on next if they have a lot of ideas. For me as an agent, it's always big picture. If everything goes right, we're working together for 40 or 50 years. This is a 24/7 job. It doesn't turn off. Brenda: A lot of conference talks are about following your bliss and writing what you know, what you want to write. But if people need to pay their heating bill, shouldn't they be concerned with trying to write something marketable? BarBar: Get a job. This is not something you get into with the intention of supporting your family on. If that's what you're hoping to start out as. This is not an easy place to make a living. Even after you've sold a book, all of you know how many books are on shelves, websites, catalogs, it's a big gamble. I support this industry at every opportunity, I buy books like a crazy person. But it's still really hard. If you've got a trust fund and don't have kids to worry about, sure, you'll be okay. Brenda: How do you manage the business of books for an author for the year? BarBar: It's a constant conversation. Holly Black had a five-year plan form and I've used that with other clients going forward, they fill it out with various goal ideas. It's a good thing to have in my folder, we don't always look at it every year, but we never sit down and go over financial goals or anything like that. Brenda: How on earth do I stand out from a crowd as an unpublished author? BarBar: Bottom line, and I know you don't want to hear this again, it's: Make it brilliant. 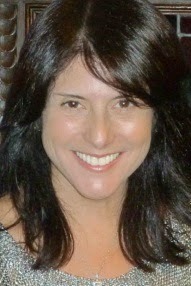 Tina Wexler is an agent in the Literary Department of ICM Partners. 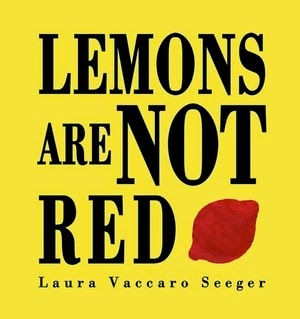 She represents middle grade and young adult fiction, as well as the occasional picture book. Tina loves being able to do passion projects that pay off. Tina says it's in the best interest of her clients to think well beyond the book and to think about the client's career. A big part of Tina's job is not only to work with her clients and read queries, but to read the books her colleagues are buying, as well as staying in touch with their wants and needs. "You're writing with your heart, writing for your passion. If you are writing to pay a bill, that's not writing that's going to sell. We can see your heart on the page and it's quantifiably better because there's passion." It's great when you can get a little bit of the voice of your story into your query. Barry Goldblatt helps to clarify that this does not mean to write the query in the voice of your character. If you are using social media as a part of connecting to a bigger conversation that's great. If you're using it to avoid work then it's not helpful. If you are using up time to compare yourself to others, it will make you crazy and get in the way doing your work. Agent Brenda Bowen (at podium, right) moderates the panel - right to left, Barry Goldblatt, Jennifer Laughran and Tina Wexler. Keith Frawley: Dad, Husband, Illustrator, Goofball, Cookie Monster & Backyard Kickball Champion. Keith Frawley is a New York based illustrator. Keith illustrates for the children’s market and for national agencies. 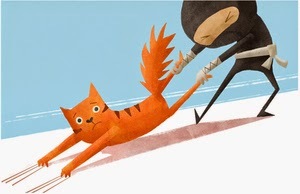 His work appears in children’s books, apps & character design. 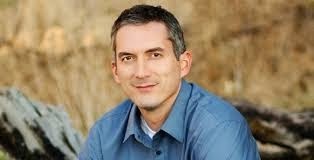 James Dashner is the author of the Maze Runner, recently released as a film by Twentieth Century Fox. His other works include The Eye of Minds and The 13th Reality. A favorite thing before being published was going to conferences like this one to hear other writers' stories. James has always loved stories, and writing them, even though they were really bad. He also read like crazy: Charlotte's Web, Hardy Boys, James and the Giant Peach. James studied accounting in college, but he still dreamed of being a writer and he wrote his first novel. A small publisher published his first books and because of them he was able to connect with writers and agents. He then wrote the Maze Runner and it was rejected across the board. But he didn't quit. He went on to write The 13th Reality, again to a small publisher. 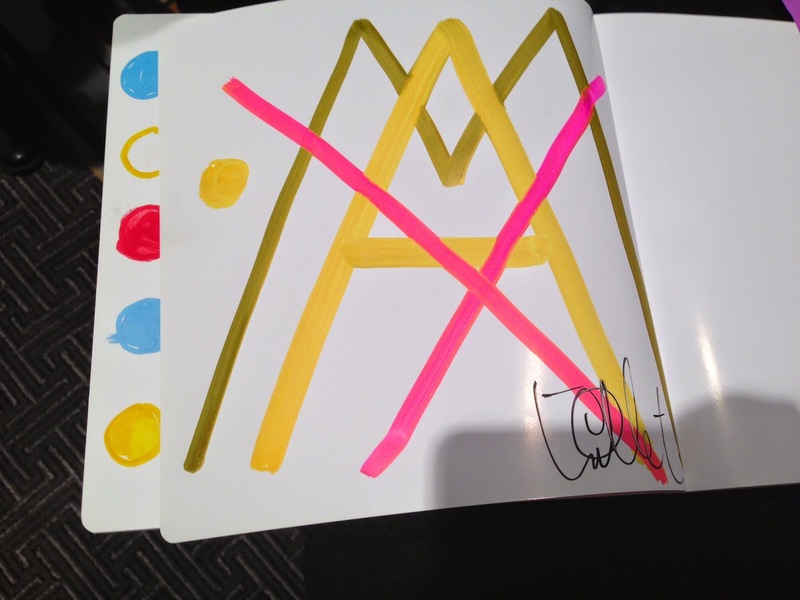 After, he took out the Maze Runner again, rewrote it, and sent it to his now agent. It sold! 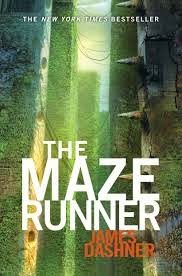 The Maze Runner has now been published in many foreign markets, and Twentieth Century Fox made the movie. James has a stack of 30 or 40 rejections, most belonging to the Maze Runner. His successes are a combination of sticking with it, not giving up, but he admits he also had some really lucky breaks. If you quit you don't give yourself the chance to get those lucky breaks. "You have no idea how thankful I am every day that I didn't give up." Laura shows us a slide of all the books she's done, and how happy she is to have done them all with her editor and now friend, Neal Porter. 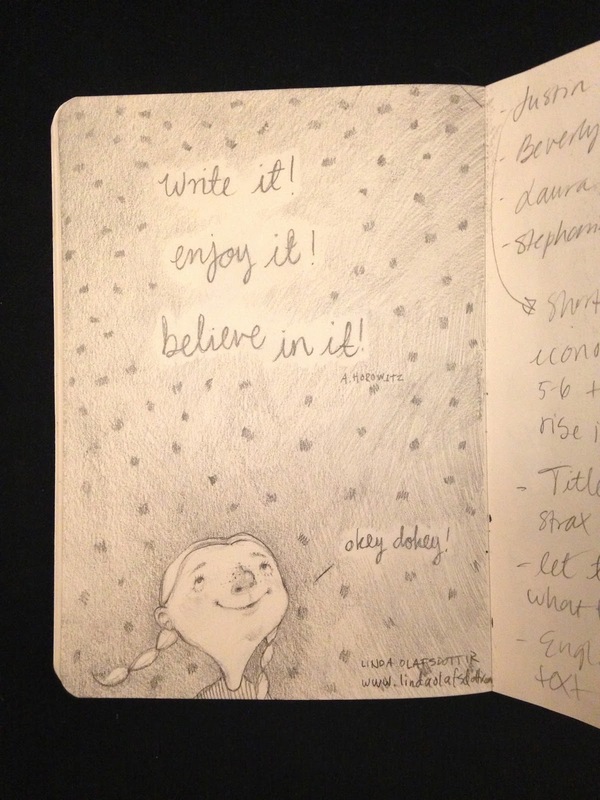 It all starts with journals: a place for doodles and stream of consciousness thinking. Laura numbers all of her pages in a journal and makes a table of contents for remembering those fleeting good ideas—brilliant! A lot of times, one book will inform and shape your next book, especially for concept books. Laura loves exploring opposites. 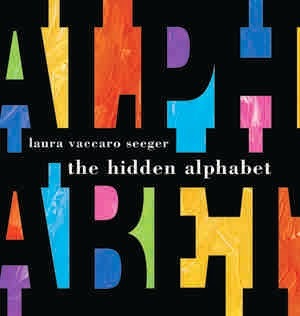 For the hidden alphabet, she used negative space to force the reader to read the shapes of the letters, using die-cut shapes to do that, led to Lemons are Not Red, where die-cut shapes force you to think about why a certain thing is not a certain color, and to wonder what the page turn will reveal as the correct answer. Even when making a concept book, there's always story. Whenever you can add story to something that's ostensibly just conceptual, it adds another layer to everything and makes the book better. Sometimes you get an idea you believe in, but you get to a point when you're working on it where you think it can't work and you want to give up. Laura says you have to trust your first instinct and carry on. 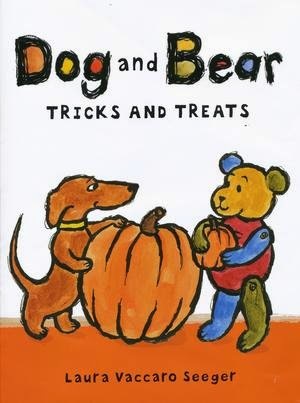 How Laura built the characters for Dog and Bear: She started with a list of their character traits, it turns out she is a lot like Dog, and Neal Porter is a lot like Bear. It makes the writing process easier and the story more authentic when you know your characters well. 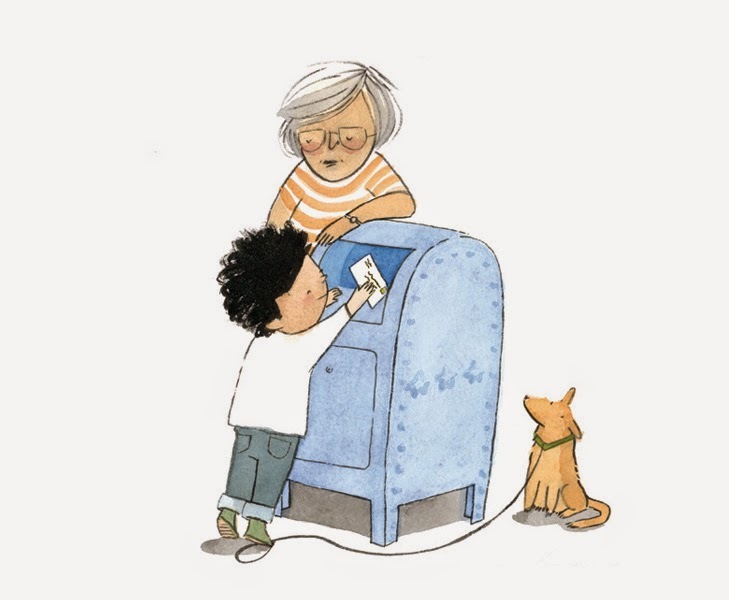 It's so fun to watch Laura illustrate the power of prediction and page turn in a picture book by reading us a snippet of Dog and Bear: Tricks and Treats and One Boy. Next she shows us a screenshot of a manuscript with all of it's revision notes (there are many). Laura understands how attached artists get to their art, but, she reminds us, we have to be willing to let go of a lot of stuff. Make very, very very rough storyboards because PACING IS EVERYTHING. 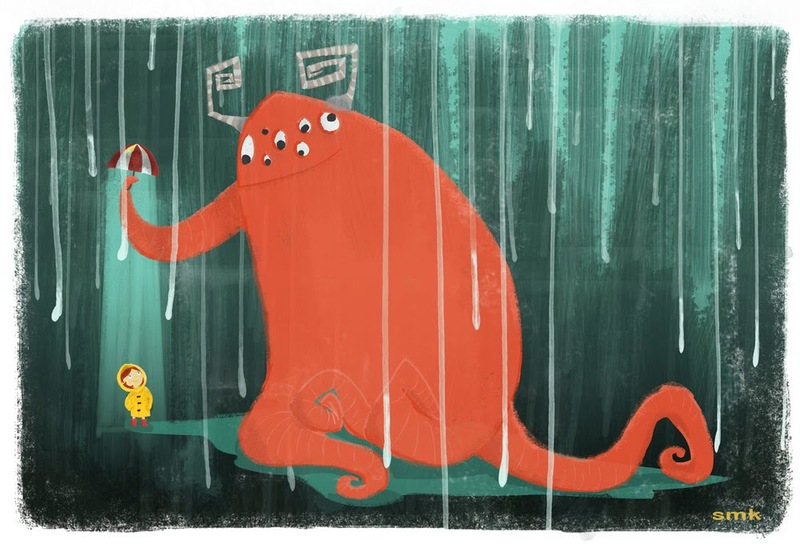 Do character design explorations, then figure out the essence of your book. For BULLY, after doing all of her character design studies, Laura realized the essence of her book was that the main character was rough around the edges, and that all of her existing art supplies were too soft. Laura ended up inking all of the art in BULLY with a stick she found in her yard. 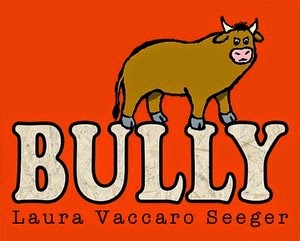 Laura also uses BULLY to illustrate how you can control how a picture book is read by varying the size of your type. So much fun! 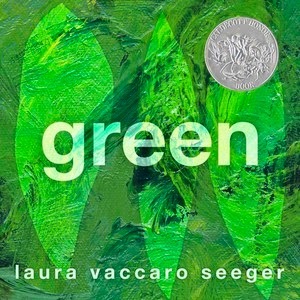 Laura shows us the evolution of GREEN, which began in an email from Neal in 2007 giving Laura the title GREEN until its publication in 2012 and subsequent Caldecott Honor in 2013. After Lin leads us in a Happy Birthday serenade to Jane Yolen, Jane takes the podium. Jane speaks about starting and re-starting careers, explaining the motivation for her establishing the Jane Yolen Mid-List Author Award. This year there was an honoree (Jane Mitchell) and a winner, and the winner was here - Jane called Sanna Stanley up on stage to applause! Congratulations to both Jane Mitchell and Sanna Stanley! 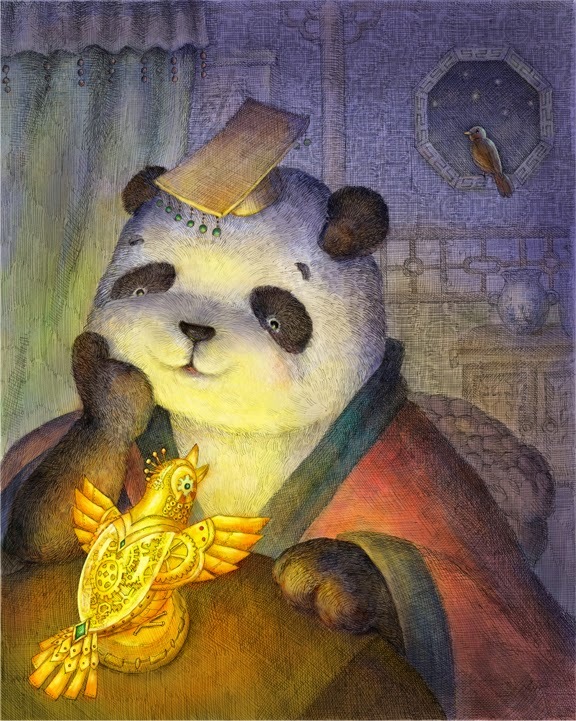 And you can find out more about the Jane Yolen Mid-List Author Grant here. Cautioning us that a lot of what we've lost is the institutional memory of children's books, Jane Yolen asks us to remember Bernice "Bee" Cullinan, who was past president of ILA (International Literacy Association) and began Wordsong at Boyds Mills Press - which was the only dedicated poetry line in children's books. Bernice passed away earlier this month. 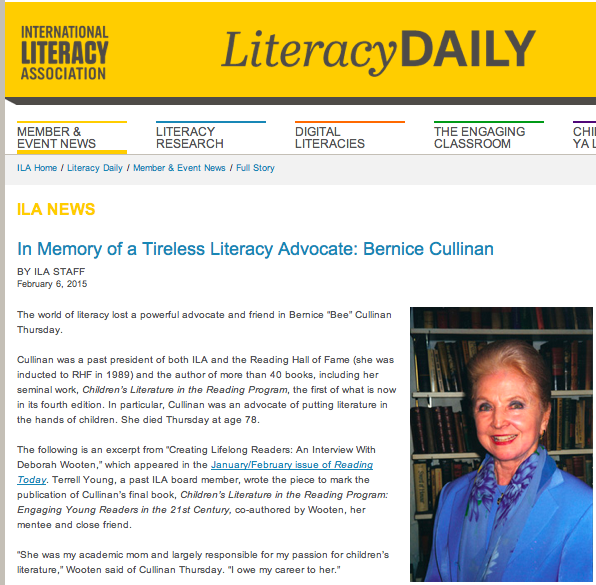 You can find out more about Bernice in this tribute article here. It's an exciting moment as Sarah Baker announces the two honorees and the winner, who will get three appointments with art directors! How Do You Take Notes at Conferences? 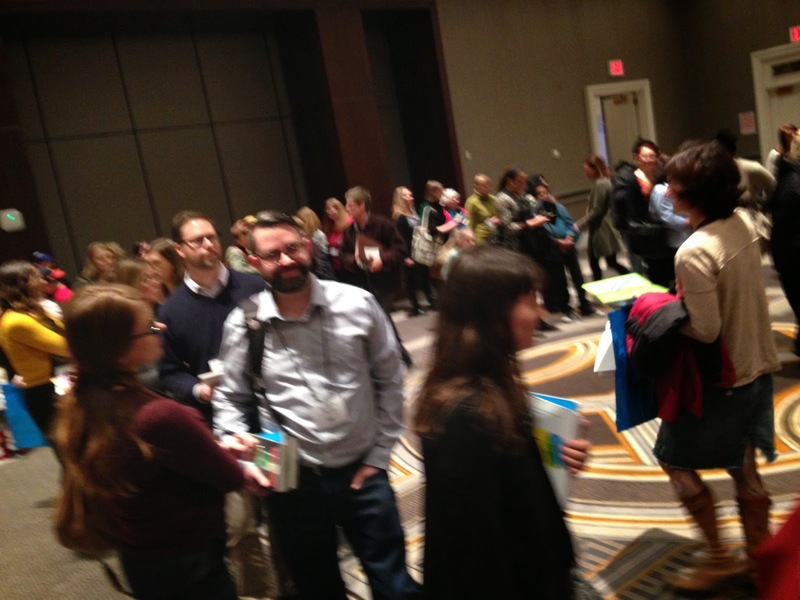 Welcome to the 2015 SCBWI Conference in NYC!